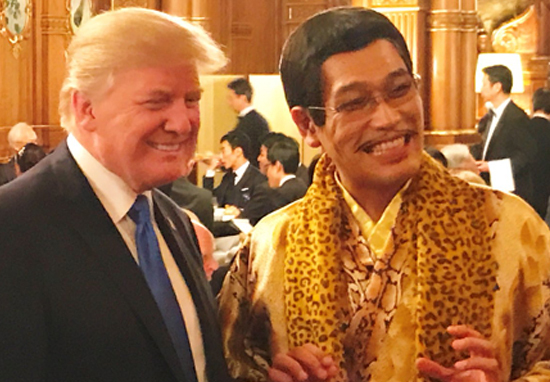 Pikotaro – yes, he of the Pen Pineapple Apple Pen song – was selected to sing for the 45th President of the United States at a sumptuous dinner during The Donald’s tour of Asia. And exuberantly jolly Pikotaro – real name Kazuhito Kosaka, stage name Daimaou Kosaka – literally could not be more delighted. Yes, this is a man who gets excited by pens but still, his grin here is on another level entirely. Pikotaro – whose homage to fruit and stationery shot to No 1 on the Billboard Japan Hot 100 – was reportedly chosen to sing before the formal audience to help keep the mood of Donald Trump‘s visit ‘upbeat’. This is an extremely important trip for the American president, who will be discussing the ongoing tension with North Korea, as well as the earworm that is Pen Pineapple Apple Pen you would hope. In typical Pikotaro fashion, the unique entertainer truly stood out from the sombrely dressed crowd. He sported a faux leopard skin scarf draped over a flowing gown with a snakeskin pattern, similar to the dazzlingly distinctive style he rocked in his music video. I have had a very valuable experience in my life today. Also, I just make fun music. And I want to deliver a small smile to everyone. Mixing with dignitaries, the friendly comedian appeared to be in his element; shaking hands and even getting guests to perform his signature PPAP hand gestures. Pikotaro is beloved worldwide, and his fan base even includes Donald’s young granddaughter Arabella, who sang along to the surprise 45 second hit in a viral video of her own last year. It is believed prime minister Abe invited Pikotaro to perform on the basis of Arabella’s video, which the two world leaders discussed in November 2016. When I told him that I’d never seen such a cute version of PPAP, he was really happy. My theme is world peace and love for family, cousins and second cousins. Based on this concept, I’d like to stick pens in apples together with everyone. I know that peace is very difficult. But whether it lasts for 5 years or 2 seconds, peace is still peace. I can make peace so long as it’s only for a minute. I know that my current situation is a party. I know it’s a party, but I’d like to do my very best to keep the party going for a long time. I have no intention of representing all Japanese culture, but do hope to continue presenting a taste of it. Could Pikotaro be the global leader we’ve been waiting for?